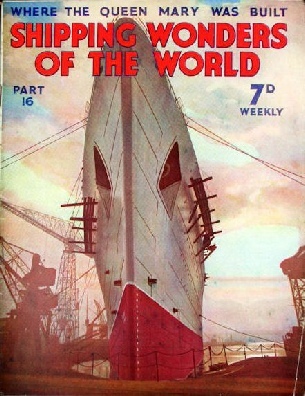 Part 16 of Shipping Wonders of the World was published on Tuesday 26th May 1936. 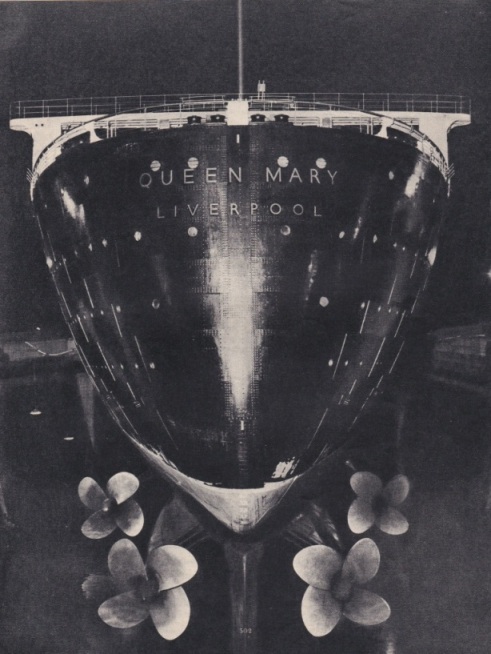 It included a centre photogravure supplement featuring the RMS Queen Mary, which formed part of the article on Where the Queen Mary Was Built. This week’s cover shows the Cunard White Star RMS Queen Mary in the early days of her construction when she was in the fitting-out basin at John Brown’s Yard at Clydebank. 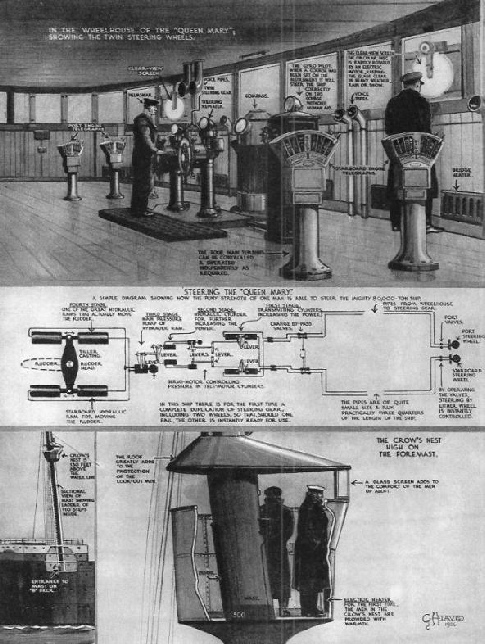 The Queen Mary was the first ship to be fitted with twin steering wheels in the wheelhouse; should anything go wrong with one set a change over can be made in a few moments. The second of the three diagrams shows how the man-power at the wheel is increased stage by stage until the gigantic hydraulic rams move the 140 tons rudder. By the aid of the Sperry Gyro pilot the Queen Mary can also be steered, when set on a course, without a helmsman. The Sperry Gyro pilot will keep the ship’s head on that course in calm or storm. The third diagram shows the features of the crow’s-nest. Reached by climbing 110 steps inside the hollow steel foremast, the nest, which is 130 feet above the water-line, has a glass weather screen. The diagrams are by G H Davis. This interesting table is reproduced from page 488. It lists all the carriers in the Royal Navy, including the Ark Royal, which had been laid down in the preceding year. All these carriers are described and or illustrated in the article. This chapter discusses the evolution of the aircraft carrier, which, although it has been a unit of the Royal Navy for more then twenty years, is still an experiment. The article is by Hector Bywater, and is the fifth in the series The Navy Goes to Work. JOHN BROWN’S GREATEST TRIUMPH, the 80,000 tons RMS Cunard White Star liner, Queen Mary, in the fitting-out basin at Clydebank. The fitting-out basin is for John Brown’s own use, and is equipped with cranes lifted up to 150 tons and able to take the largest ships. It is known as the Clydebank Tidal Basin, and has an area of over five and a half acres, is 900 feet long by more than 300 feet wide. It has a minimum depth, at low water on ordinary spring tides, of 30 feet. An interesting feature of the Queen Mary’s bridge is a slot that runs to port and starboard of the wheelhouse to the wing houses. This slot consists of a curved strip of iron supported out beyond the front upper edge of the bridge. It has been designed to create a screen of high-pressure air to protect the bridge staff against the rush of air. The wind strikes the front of the bridge and passes through the slot, and the narrowing nozzle increases the speed of air to such an extent that an invisible screen is formed along the greater part of the bridge. So strong is the pressure of air thus created that not only wind but also rain and snow are deflected over the heads of those on the navigating bridge. The bridge of the Queen Mary is also notable for the twelve feet overhang which projects beyond the sides of the ship. This makes it possible for the navigating staff to see the whole length of the ship from either the port or starboard wing house. Famous for having built ocean greyhounds and the world’s largest battle cruiser, John Brown’s yard at Clydebank reached the peak of its achievement with the construction of the Cunard White Star RMS Queen Mary. The chapter is written by Frank Bowen. 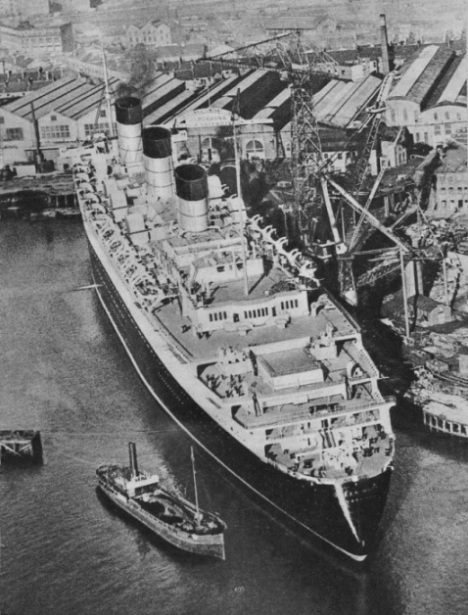 The Queen Mary is the logical successor of a line of famous ships built at Clydebank. Among the great ocean-going liners built there you have only to recall the Lusitania, the Aquitania, and the Empress of Britain. Famous warships include the world’s largest, HMS Hood (42,000 tons), HMS Repulse, and HMS Barham. Frank Bowen not only tells us something of the history of John Brown’s achievements, but also gives interesting information about the preparations that were made for the building and the launching of the Queen Mary. You can read more on the Queen Mary in part 1. 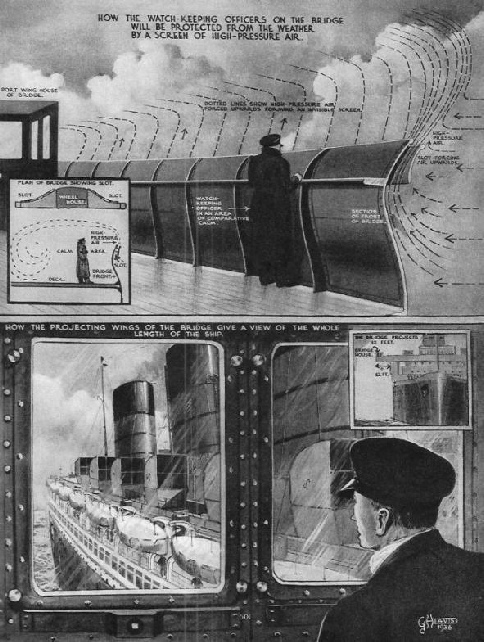 The article incorporates a photogravure supplement featuring more pictures of the Queen Mary, and these are shown below. Although she did not achieve the success which was expected of her, the Great Republic is generally regarded as the masterpiece of her famous builder, Donald McKay. The article is by Frank Bowen, and is the sixth article in the series Speed Under Sail. When the Queen Mary came to Southampton from the Clyde, she had her own officers and crew on board, but she was not then owned by the Cunard White Star, and did not become its property until her trials were completed. Until then she was under the control of John Brown & Co, and on her voyage from the Clyde flew the John Brown house flag. It is on the trial trips of any ship that she must generally be accepted or rejected by her owners. IN the Baltic Sea the need for rapid transportation of crude and refined oil has been responsible for the building of a number of interesting little ships. They have their counterparts elsewhere, but because of ice conditions in the Baltic it is necessary for them to have a specially reinforced fore end with an ice-breaking stem. The ship illustrated is the Brannaren, built at Malmo and completed in September, 1933, for the Swedish Navy. This is the eleventh article in the series on Merchant Ship Types. To conduct a ship safely across the high seas to a distant port calls for skill of the highest order and an intimate knowledge of the science of navigation. This chapter, written by Lieut.-Com. R T Gould, a retired navigating officer of the Royal Navy, gives a clear account of the instruments required. Amongst those illustrated and described are the sextant, the wire-sounding machine, the marine chronometer, the standard magnetic compass, the hand-lead, the echo-sounding machine, the hand-log, adjusting the ship’s compass, the gyro-compass, and the chart house. other side of the world. The methods and instruments of navigation are, however, few and simple. Given a chart, a compass, a log and lead, a sextant and a chronometer, a navigator can take his ship across the world and home again. 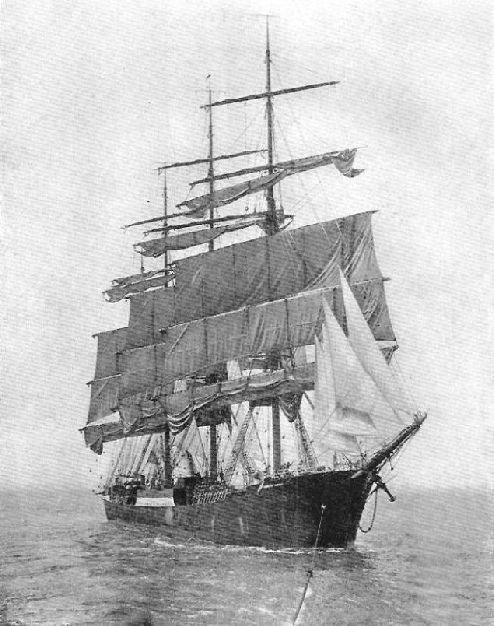 The picture shows the German four-masted barque Padua (2,600 tons) after having sailed from Australia, a distance of some 11,000 miles, to Lundy Island, whence she is being towed up to Avonmouth and the port of Bristol. The British Navy, with 120 ships and thousands of men, blocked the harbour at Ostend. By chance, a German submarine, in attempting to sink the British cargo boat Araby, achieved a similar result at Boulogne. You can read more about this salvage in chapter XIII of David Masters’ book The Wonders of Salvage. This article is by David Masters and is the fifth in the series Dramas of Salvage. The article concludes in part 17.